The cards were created in ink and watercolor on 2.5" x 3.5" sized paper. It was in 2010 originally designed to be a mini novelty deck, but due to demand, is now available in various sizes. This is the largest edition, which is still smaller than average, measuring 8.9 cm tall x 6.4 cm wide. 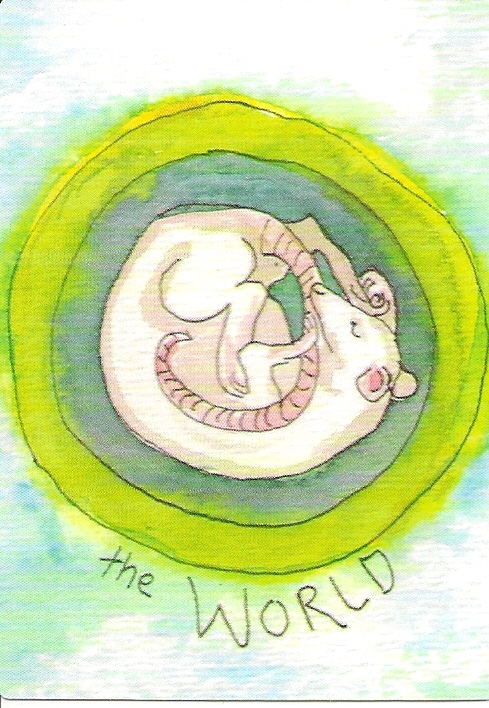 The TaRat is a 78 card deck, each card with a different image of white rats. There are Swords, Cups, Pentacles and Clubs in this deck, as well as underlying themes of stars, moons and planets and some birds. The majors are un-numbered. The minors are scenic and are sometimes, but not always, similar to the RWS. The backs are reversible. It came with a one-page sheet of card meanings and an envelope of inclusions from the artist. No title card, no bag, no box.